Try an app that makes your comics look great, makes reading them a pleasure, and takes all the friction out of importing and managing them. 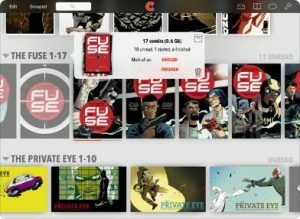 Chunky supports CBZ, CBR, CBT and PDF comics, and understands ComicRack and ComicBookLover tags. It can browse and download directly from iCloud Drive, Dropbox, Transporter, Google Drive, OneDrive, Amazon Cloud Drive, Box, Pogoplug, Mediafire and Copy, and you can copy files in and out with iTunes on your computer or download them via the built-in web browser. It’s an incredibly good CBR/CBZ and PDF reader. Behind its clear interface are a number of settings that will fine-tune the reading experience (such as right-to-left reading order, old page yellowing reduction and many more). There are two features that elevate Chunky above other comic reading apps. One: it allows you to grab and share user-defined screenshots. Two: it allows you fetch content from a variety of different locations: web, icloud and – most usefully for me – from local NAS storage. Getting content is, like everything else about Chunky – incredibly easy and straightforward. Additionally, there are no IAPs or links to paid-for comic content – which is something else that sets itself apart from other apps of this type.